The year 2000 marks the thirtieth anniversary of the publication of A Little Commonwealth by Bancroft Prize-winning scholar John Demos. 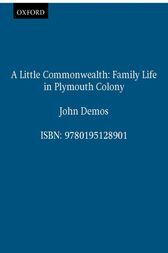 This groundbreaking study examines the family in the context of the colony founded by the Pilgrims who came over on the Mayflower. Basing his work on physical artifacts, wills, estate inventories, and a variety of legal and official enactments, Demos portrays the family as a structure of roles and relationships, emphasizing those of husband and wife, parent and child, and master and servant. The book's most startling insights come from a reconsideration of commonly-held views of American Puritans and of the ways in which they dealt with one another. Demos concludes that Puritan "repression" was not as strongly directed against sexuality as against the expression of hostile and aggressive impulses, and he shows how this pattern reflected prevalent modes of family life and child-rearing. The result is an in-depth study of the ordinary life of a colonial community, located in the broader environment of seventeenth-century America.Demos has provided a new foreword and a list of further reading for this second edition, which will offer a new generation of readers access to this classic study.